Broken eggs or starry eggs are one of the signature dishes of Madrid bars. They are prepared very easily and there are usually many variants of this recipe. In addition to fried potatoes, the starry eggs (they are also called that), usually carry another companion that varies between sausage products, some fresh protein, or even vegetables and mushrooms. Your version more classic is that of broken eggs with ham , followed by the incredibly delicious broken eggs with chorizo ​​. There are also broken eggs with chistorra, eggs broken with gulas, broken eggs with mushrooms, and then there are mixtures that include several ingredients: broken eggs with mushrooms, chori Zo and peppers, and things like that. Is not it wonderful? Usually for this dish traditional French fries are used, sticks, but you can also use potatoes cut into wedges, slices and there are those who use potato chips. Whatever your preference, they should be fresh and slightly crispy. If you know how to make fried eggs in a pan, you will not have problems with this recipe. Of course, you should leave the yolk quite liquid. You can season them with pepper and smoked paprika. If you use ham, use slices freshly cut. If you go for chorizo, chistorra or another protein, fry them a bit in the same oil as the eggs. If you include mushrooms or peppers, quickly jump them just before serving the dish. As you can see, the ingredients of the crashed eggs are all high in calories, so we are talking about a rather powerful dish, ideal for people who do a lot of physical activity, who are very hungry and do not care about anything or who are simply unconcerned with a privileged metabolism. Preparing broken eggs is extremely simple. And the variations are only limited by your imagination. Let's go now with the recipe! Important to clarify that, if you do not want to prepare them with chorizo ​​but with ham, For example, simply substitute one ingredient for the other and follow the other steps of the preparation. Remove the skin and cut the potatoes the way traditionally fried potatoes are made. Although you can also make them on slightly thick wheels for a change. Fry the potatoes in a large skillet over medium-high heat for 10-12 minutes with plenty of oil. Meanwhile, cook your sausage in another pan with a drop of oil. Chop it on thick wheels so that it becomes faster. When the potatoes are ready, remove them from the heat and drain them well.Remove when they are ready. 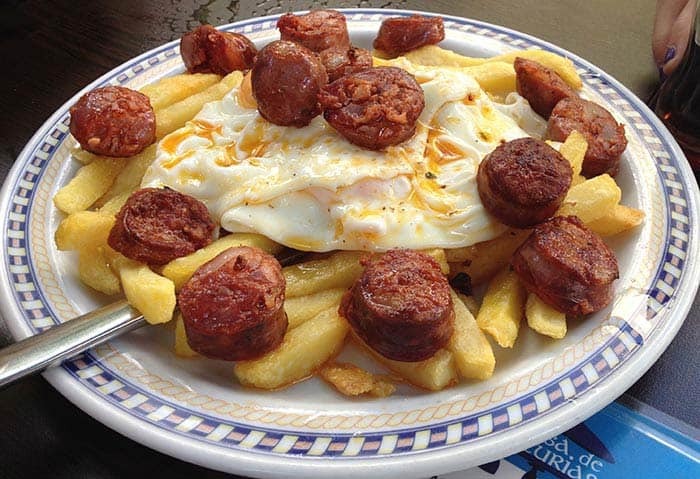 Now simply serve on a plate the potatoes first, the 2 eggs on top and chopped chorizo ​​on wheels. Some people, and in fact you can see it in some bars, they serve this dish with the literally broken eggs: they put the potatoes in a casserole, the eggs on top and they start them with a knife in a way Let the yolk begin to spill, put the ham, some peppers and take it to the table. Feel free to do it at home. Remember that you can prepare this dish with anything that provokes you: black pudding, ham, bacon, ham or, of course, all the previous ones ! You can even make a super dish: broken eggs, but instead of fried potatoes, with patatas bravas! Ideally, use this food as a tapa or a portion to share between several people. I recommend you also prepare roasted grill peppers, a potato omelet, perhaps some delicious homemade ham croquettes and, of course, accompany it with a good bottle of red wine. This way you will have a full table delights that will make your guests delirious.